I wrote an article about staining wood some time ago, but here I’d like to show you how to make pallet wood even more interesting. Most of the pallets used for projects have been around for some time so already have some character but what if you want to use new pallets? 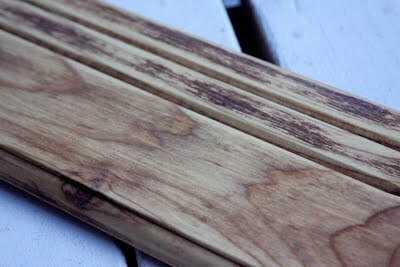 I’ve found 8 ways how to make wood look old, weathered or distressed. Of course, you can find more online as people are experimenting all the time to achieve desired results. I’ve picked the ones I really liked and I’m going to try out myself. The first one is pretty straightforward. I’ve found it on prettyhandygirl.com. To achieve that kind of weathered look all you need is two stains. First, you need to stain the wood with any sun-bleached color stain (like Rustoleum wood stain) and wipe off the excess. Then you add a little brown stain(i.e. Minwax Early American ) and wipe it off. You could use a weathered gray as well. It is a trial and error method so you have to check for yourself if you like the results which also depends on the kind of wood you’re staining. And what I mean by that is that some kinds of wood are darker and some are lighter in color. Therefore, they going to look differently after staining. Some of them are softer/harder than others and that is reflected in a way the wood is “drinking up” the stain and that affects the final result. This is another method I’ve found on prettyhandygirl.com and I like the end result better. The outcome is kind of like a rustic barn wood and all you need is a glaze. You mix 4 parts of clear mixing glaze with 2 parts of translucent color glaze (here in mocha) and 1 part of antiquing asphaltum glaze. Stir it and adjust the color to your liking adding more mocha or more asphaltum. Next step is to brush the glaze onto the wood, tap the brush on a stick to give it some “freckles” or rub it in. She used a Valspar glaze but any other would be fine. If you want to add a nice touch to your projects like iron wrought nails, hooks or handles why not check my latest post on How to Give Your (Pallet)Projects The WOW Factor. First, you have to sand the wood. It all depends on how rough it is. If you new to sanding have a look at my Wood Sanding Tips. The end result doesn’t have to be very smooth but I’d advise using orbit sander or random orbit sander. Paint the wood with white paint. Any wood paint or latex paint would do as long as it’s not glossy. However, if this piece of wood you painting is going to be heavily used or placed outdoors I’d go for wood (oil-based) paint. It would give you that extra durability even though you would want to put a coat of finish on top. If you want to go for a more in-depth effect you can use 2 colors on top of each other. Just remember to let the paint layers dry completely (it takes longer for a wood paint to dry). Sand the wood again with a coarser sandpaper grit like P-80. The effect you’re after is that some of the wood grain visible through the paint layers. Now it’s time for staining. Get some dark brown stain and a cloth and rub it all over the wood. You will notice that the visible wood grains left after second sanding will pick up the color beautifully and the white paint will turn into a grayish weathered one. The last step is sealing. Make sure you won’t skip this one as it’ll give your piece a longer life. The finish you’ll use depends mainly on a couple of things. First is the location of your project- indoors or outdoors. And second what kind of a paint/stain is used. What I mean by this is that if your stain is oil based you can’t use water-based sealant. For more information on wood stains, I invite you to read How To Stain Wood – The Ultimate Guide For Pallet Projects. I’m sure you’ll find some more answers. I think this method is the most popular one online. This one comes from upcycledtreasures.com (now Mountain and Modern Life ) and it’s very simple. First of all, you put the steel wool in a jar and pour in the vinegar. The kind of vinegar you use will have an impact on the color of the finished wood. Darker kinds of vinegar tend to stain more and, therefore, the effect is more intense. Saying that it also depends on what kind of wood you are going to use it on. You leave this mixture for some time (between 24 hours and 5 days). When it’s ready it’s tea time lol Well not exactly ;) You need to brew some black tea in the second jar. Make it very strong like let it sit for around 2 hours. The idea of using tea is that the tannins that are in the tea can enhance wood’s color and depth. But it’s only useful for light woods like pine. Darker wood has naturally got more tannin. After the tea has cooled you need to either brush it on or use a cloth and put it on the wood. Make sure you wipe the excess off. Next step is to apply the iron-vinegar mixture on the wood using a paintbrush. Make sure the strokes are even and along the grain of the wood. Let it dry and after that, you can sand it with fine or very fine sandpaper. The last step is to finish off with a coat of sealant of your choice. This is another simple way to change a wood appearance. It comes from radmegan.com. If you want to use this method choose darker wood that contains more tannin. This includes cedar, pine, red oak, redwood, and mahogany. If you want pallet wood looking aged this method is great for unused pallets. This way you get the imperfections of pallet wood and the aged look. There are two ways of doing this. The first one is time-consuming. The second one is the choice you’ll go for if you haven’t got much time. Well, who has? lol In both cases, you need to put your piece of wood on a sawhorse or something similar to expose all sides. You can always flip the wood and repeat the whole process. You need to make a solution 1 part of baking soda and 1 part of water. The amount depends on how big your project is. Apply generously with a paintbrush. Make sure the wood is covered in a thick layer. Now you can go the long way which is letting the wood sit in the sun all day or at least 6 hours or spray the piece with vinegar after applying water and soda solution and let it sit for 10 min. That’s some shortcut, isn’t it? Now after you did all of the steps you need to brush the wood surface with a wire brush. You’ll see the tannin may come off with the brush. Rinse the wood with water and dry it with a cloth. Repeat the process the next day if the wood is still too dark. Finish off with your favorite sealant. Because you want your wood to look aged I don’t recommend anything shiny like varnish. I you like the look of old cracked paint this is a fantastic way of achieving the looks without the cost of professional crackle medium. All you need is a paint in two contrasting colors and all-purpose glue or school glue. The first step is to paint the wood with a base color coat and let it dry. Then smear it with a generous amount of glue. This is a very interesting method for rustic, used look fans. It’s more complex and involves using more accessories than the previous ones. It comes from EHow. Let’s start with a list of necessary items. The first step is to cover a piece of wood with brown wood stain or shoe polish if you haven’t got a stain at hand. You want to put the stain on the wood using old cloth and wipe the excess off. As for shoe polish use a shoe polish brush. In both cases make sure that the pigment really sets into the wood. Let the stain dry. Next step is to determine places of natural wear and tear such as corners or edges. Take a piece of paper towel to rub candle wax, paste wax or petroleum jelly into those wear-and-tear areas. Now the wood is ready to be painted including the places covered in wax etc. After the paint has dried use a paper towel to wipe off the paint from the waxed places using side to side motion. The wood grains will start to show from underneath the paint. Carry on as long as you happy with the result. Then use mineral spirit to get rid off of the rest of the wax, using a paintbrush. Now the secret part :) Using a blowtorch carefully burn the wood in some places. And to give the wood that old weathered barn look that is worn with dents and blemishes give it some beating with a hammer to create nicks and scratch marks. Then hit it with a chain and treat it with some sandpaper. Well, that’s a good way to let some steam off … lol. And that’s it. You can put some finish on top if needed. Another simple yet effective technique for giving a wood that unique look. It involves using a blow torch. All you have to do is to blacken wood along the grains and you’re done. Just make sure you won’t overdo it then put a finish to seal it. Below it’s a great example of working with a blow torch found on Facebook. I hope you liked these ideas to make a pallet wood unique and more interesting. If you have any questions or more ideas leave a comment below. Really interesting article – my father is into aging wood on furniture and he uses a sort of homemade vinegar/tea stain. I have to admit – it looks brilliant when he finally gets things ready! Some ingenious methods here on how to make wood look old, weathered or distressed. Really like the cheap way of achieving the old cracked paint look. Just paint… and glue, never would have thought of using glue to do that! I stumbled on this great post by chance, but I love the use of wood around the house, and if you can achieve some cool effects like these without it costing the Earth then I’m all for it. What’s your favourite method here in terms of effectiveness? Thanks for your comment :) This is really a top of the iceberg regarding changing wood appearance. There are so many ideas out there and new ones keep popping out as more people experiment. The whole idea with pallet projects is to keep it cost effective, so cheap, home made solution are the way to do it. As for your question. I don’t think I have a favourite one because every project is different. The pallet wood differs in type and condition so the final results are different. So one method may be more effective than other depending on these circumstances. Thanks for this post. In your pictures for the steel wool and vinegar stain, which vinegar did you use on the crate? Balsamic? I’m glad you liked it. You can use any type of vinegar like spirit, malt or apple. I’d not recommend balsamic mostly because it’s more expensive that the other types. This is some really good information about how to make wood look weathered. I liked that you talked about how it would be a good idea to use vinegar and baking soda to weather the wood. I am going to be making a wood pallet headboard and I would love for it to look antiqued. So, this is good stuff for me to know. Hi Ivy, I’m glad I could help! Thanks for stopping by. Your article is the best I have ever seen about treating wood. A few years ago, I tried the vinegar/steel wool idea but the results were dismal. Little did I know there was a second step! Thanks for all of your ideas!